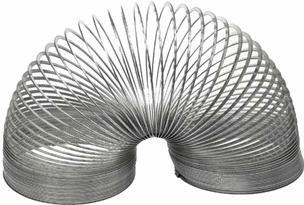 Every Kid Wanted One: Ever heard of the Slinky? The fun toy that sold more than 250 million units worldwide?! The creators of the Slinky were just ordinary people that came up with a simple product idea. And that simple product idea produced more wealth then they could have ever possibly imagined! Here’s the fascinating story: Richard James, a Naval Engineer, noticed a spring coil drop on the ground at work. He was intrigued by the fact that this torsion spring bounced around the way that it did. He took the torsion spring home and showed it to his wife Betty. The two realized that this cool spring would actually make a great toy! And that is how the simple, yet amazingly successful Slinky idea was born! Richard and Betty had no experience in the Toy/ Retail Industry, but they took a chance. They just had a feeling that people would absolutely love their new toy idea. So, Richard and Betty borrowed $500 to manufacture the Slinky. They had never manufactured anything before, but just took the necessary steps to figuring out the most effective way to get their product produced. Once Richard and Betty figured out how to manufacture their product, they decided it was time to approach retailers. But Richard and Betty’s first attempts at getting their products on the shelves of retailers proved to be very unsuccessful! They tried selling their spring toys to Small Retailers, but no one wanted to buy. At one point, they almost gave up! But they didn’t. And with sheer determination and a conviction to succeed, they finally convinced Gimbels Department Store to buy 400 units of their Slinky Toy during the Christmas holiday season. Within an hour and a half, Richard and Betty James sold their entire inventory at Gimbels and a multi-million dollar toy empire was born! The morale of the story is this: Ordinary people can produce extraordinary results if they believe in their product idea and take actions to ensure success. Richard and Betty James could have easily conjured up their brilliant Slinky idea but not taken the necessary steps to succeed. Instead, they created their Slinky toy product and made millions! And they did this by not giving up when times got tough. Therefore, if you have a fabulous product idea, I urge you to take the necessary steps to succeed today. You could be the next million dollar success story!